Ever fancy a quick make-over project, but you're not sure you want to commit to the changes? Or maybe you're planning a party and would like to make some temporary changes? I might just have the answer! 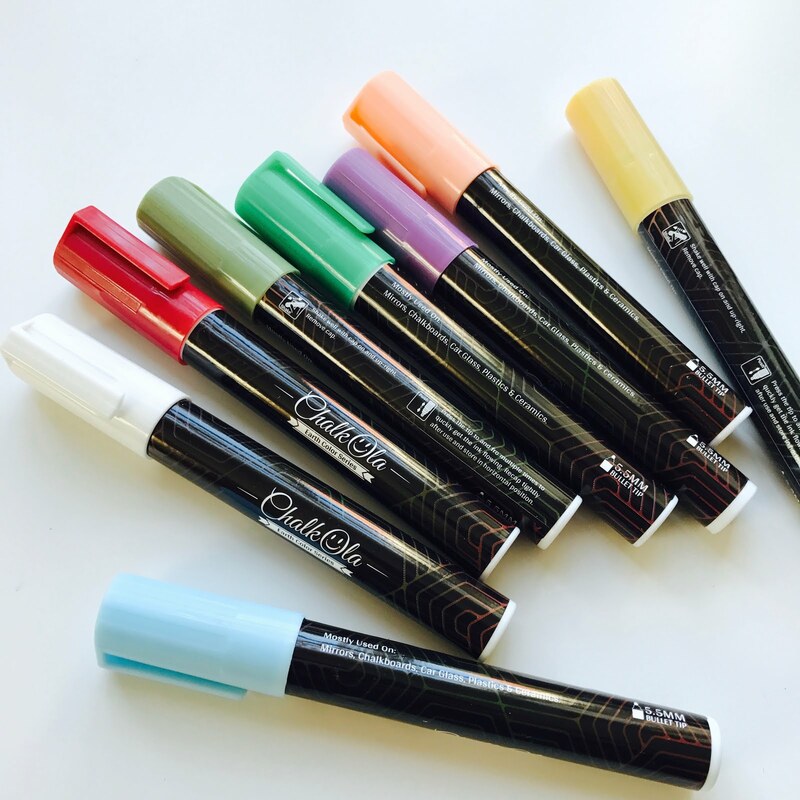 I was recently sent some Chalk Ola* premium wet wipe markers. After having fun playing around with them, I can see that they are going to be an essential addition to our craft supplies and think that you might like them too. I've put together some information, project ideas, and a few tips below. At the bottom of the post, you'll find a reader discount code which is valid on the Chalkola Arts website and on Amazon. 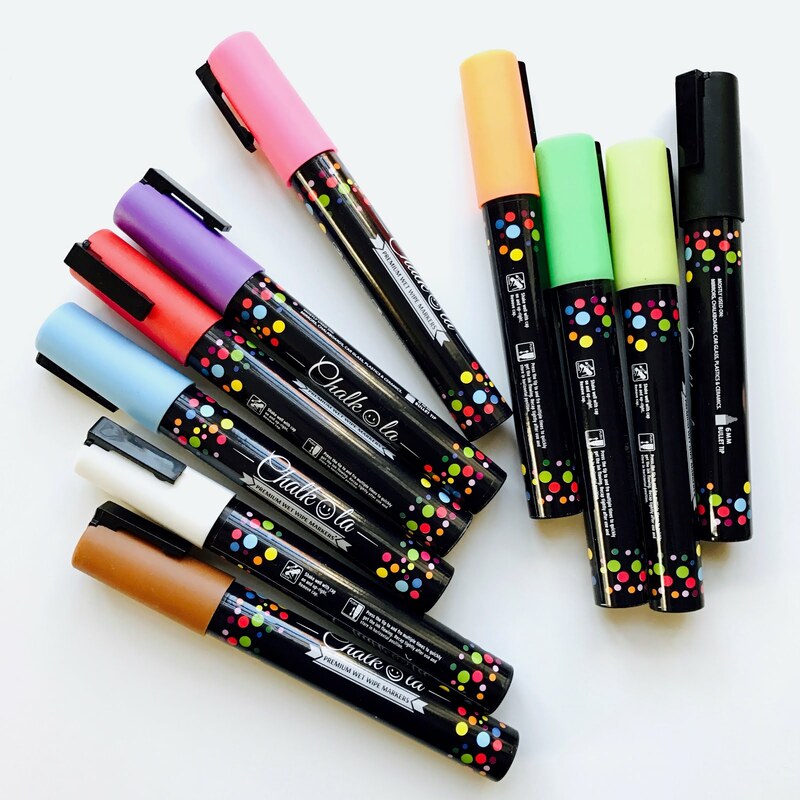 These water-based chalk pens are non-toxic, safe for children, wash off clothes and if they have any odour, I can't smell it. (They are also acid and Xylene free.) I've been testing two different sets - 10 party colours (above) and 8 earthy colours (below). The markers are intended for use on all hard non-porous surfaces including glass, whiteboards, mirrors, plastics, chalkboards and ceramics. They wipe off easily with a wet cloth. 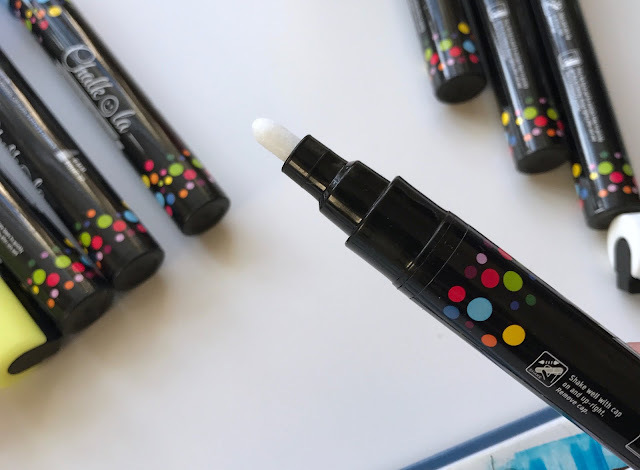 When you open the lid for the first time, there is no paint in the tip - pictured below is a black pen, you can see that the tip is still white. So you need to give the marker a good long shake (with the still lid on) and then depress the tip quickly, multiple times, until the paint appears. I like to make sure there is plenty of ink, for a more vibrant line, so I push it down a few more times before starting to write. If the nib starts to feel a bit dry, depress it again while writing (I keep a spare piece of card on hand to do this). We have a chalkboard wall in the children's playroom and I was a bit hesitant about using the pens on it as it's not a 'non-porous surface', so I tried a little bit on the edge and found that there wasn't a problem applying or removing the marks. If you're in doubt about any surface, it's best to test it first, just to be sure. On hard surfaces such as glass, the marks will come off if you rub a greasy finger over them, so I think of it as behaving like regular chalk once it's dry. I've been using these pens on our whiteboard meal planner, and even on paper which has had a gesso wash. It's worth noting that the colours do not look exactly the same on all the different surfaces - on glass, for example, the light shines through leaving an effect similar to watercolour paint. I think it looks great and this is my favourite use for these pens, being a jar addict! As the marks are temporary, I think this opens up lots of opportunities for decorative projects, these are just a few of my favourites, but I'm sure you'll think of plenty more! 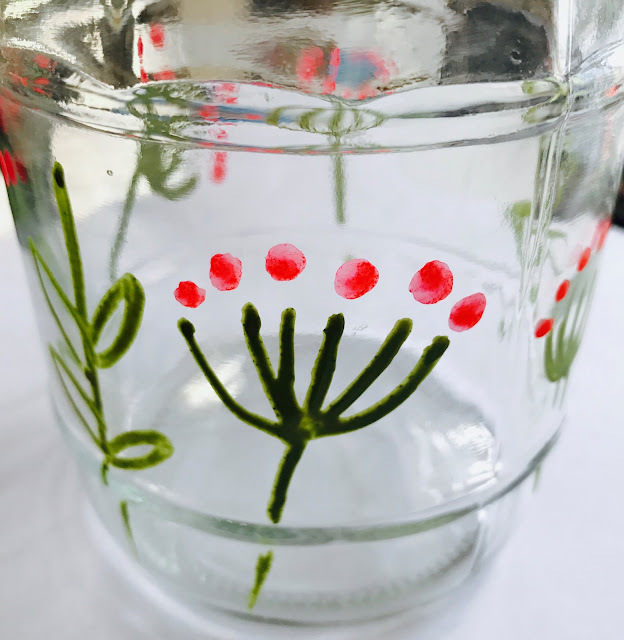 Jam jar vases (as above) in seasonal colours or to match your table setting/room decor. In place of using wine glass charms, or for indicating place settings at a dinner party - simply write the name on the base of the wine glasses, where the writing is unlikely to rub off. 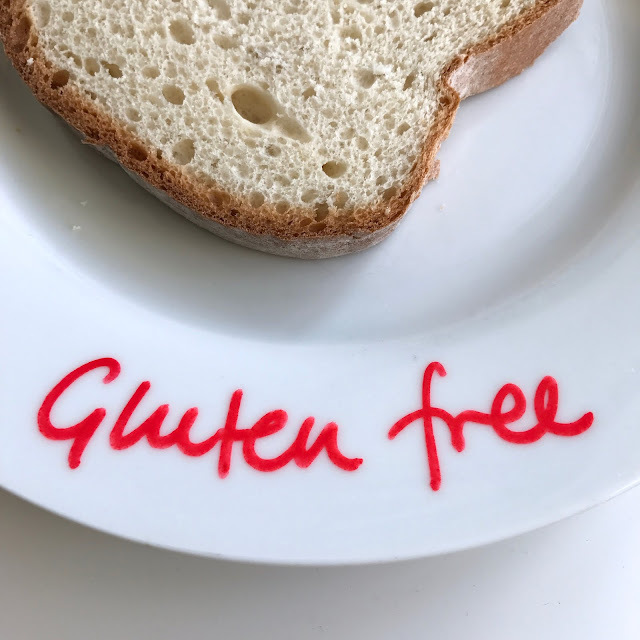 If you have people with special dietary requirements, they can be used to write on the side of the bowl - we have to distinguish vegan and gluten-free food in our family, and this is a really easy and useful way to distinguish the different options (see below). Jar lanterns - children can make them too, using battery operated flameless candles. Ever fancied stained-glass windows? You can draw your own. Leave important reminders for yourself or your family on the hallway mirror - they will wash off easily! If you'd like to try these for yourself, you can use the code 20OFFSTR to get a 20% discount on all Chalk Ola products from Amazon.co.uk or the Chalkola.com website. If you do, please leave a comment and let me know what you plan to use them for! *The pens were supplied free of charge in return for writing an honest review - all opinions are entirely my own. Amazon links are affiliate links - thank you for using them when you buy from Amazon.co.uk as this helps to support the free content on this blog. We got these for my daughter's birthday in November and had a great time decorating all the windows for Christmas. Really good fun. The marks wiped off the glass after a month, but do be careful to keep away from rubber seals round windows.